Is The 2015 Chevy Colorado In Danger Of Becoming A Failed Experiment? The 2015 Chevy Colorado is the most refined mid-sized truck in America right now, and packs plenty of capability. But for some reason you just don't care. Toyota sold almost twice as many Tacomas last month and the brand-new GM only beat the geriatric Nissan Frontier by 74 sales. We've been crying for a usable, modern, manageably-sized pickup truck and GM delivered. 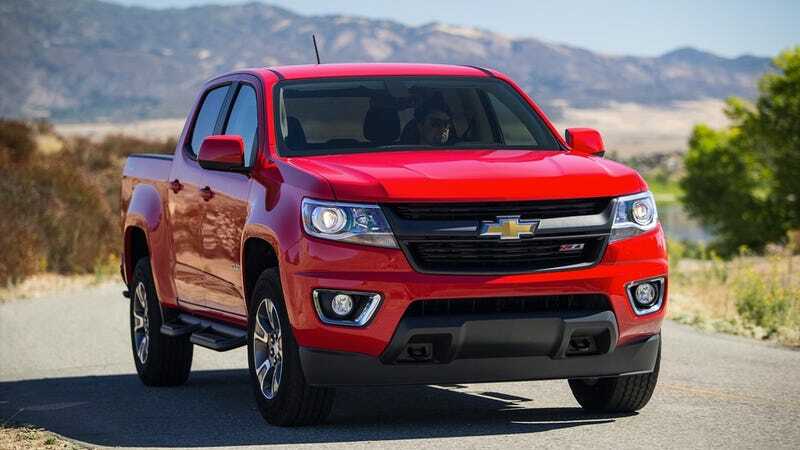 When they trotted out the 2015 Chevrolet Colorado and 2015 GMC Canyon, the company said they were more interested in creating new truck customers, rather than winning over existing ones. That's all well and good, but there's no getting out of being compared to your direct competitors who alsooffer manageably-sized and comparably capable vehicles. Last year "mid-sized trucks," a segment long limited to the Tacoma and Frontier, pretty much hovered around 20,000 sales a month with the Tacoma normally doing around 14,000 units and the Frontier in a distant second at something like 6,000. For the first month of the new year; Tacoma is in first with a sluggish 11,409 sales, Colorado way back at 5,942, Frontier close with 5,868, and the GMC Canyon selling 2,205. Combining GM's effort (8,147) puts them a lot closer to the top spot, but still a sizable chunk behind. So how'd GM go "creating new customers?" Well; January 2015 certainly did have big sales numbers for the small (sorry "mid-sized")-truck segment at25,424 units but it doesn't exactly feel like a meteoric rise from the year prior. I did not expect the archaic "okay I guess" 2014 Tacoma to blow the new Colorado out of the water quite this hard on sales after riding a long ramp of GM hype and genuinely enjoying their new truck myself. Obviously, these initial numbers don't tell the whole story. January is typically a slow month for vehicle sales, and thirty days is a tiny sampling period for a segment that's been churning essentially the same vehicles for more than a decade. (Do you see why I'm so excited the Colorado even exists?) We're lucky somebody decided to revive this market; if nothing else it's good to get the competition fired up again. That said, I sincerely hope GM's baby trucks get more people fired up about this segment and push the industry to give us continually more usable, more efficient, smartly-sized trucks. If that doesn't happen I'm a little scared automakers will just go full-hog the other way and we'll all be forced into F-450s by the next round of facelifts. So what do you think GM needs to do to pull into the top spot? Is the Tacoma just riding off its long-listed brand name? Is the Colorado just too damn big to be the "smallest option" in Chevy's truck lineup?